On October 15, 2010, my friend Maria told me that she wanted to open an Etsy shop to sell her baby blankets. She asked me to make some graphics for her shop... a banner and an avatar. YAY! I love making graphics so I sat down and googled "etsy shop banner" to see what size I needed to make her designs. What came up wasn't dimensions... it was shops, on etsy, that sell graphics. I think I about fainted. It was a huge lightbulb moment for me. So I signed up for a seller account and went to bed with way too many ideas floating madly in my head. I don't think I slept much that night. The next morning was a Saturday. I informed everyone that I was not to be disturbed, unless they were bringing me food. I sat down at the computer and didn't move for 12 hours. I did it all! I created and researched and worded and tagged and really didn't know what I was doing but at the end of 12 hours, I had 13 logo designs listed in my brand new etsy shop! I was exhausted when I clicked the Publish button on that last listing. I was SO excited... and a bit jittery from lack of food because no one brought me any. I called the fam in to see my masterpiece... but there was a problem. There were only 12 listings showing! I panicked. What had I done wrong? I figured out which one was missing. Why was it gone? Was there a problem? Did etsy not like my listing? Were they shutting me down!! Did I violate some rule? I freaked out for a few minutes before I realized... it had sold. I had sold my first logo within 15 minutes of listing it. And that is why I really celebrate today, October 16th. It's the day I completed my shop and sold my first logo design online. 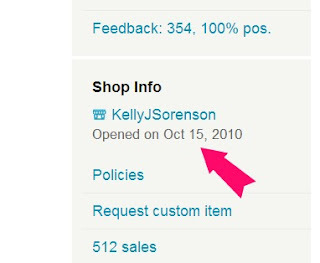 It might say the 15th on my shop but that's just the day I created my username. But hey... I guess I can celebrate two days... right? Two months later, my etsy shop became my full time job. The past two years have been AWESOME! I've met some incredible people through my shop... made some wonderful friends. I never dread getting up in the morning and I actually look forward to Monday. I don't need or even want to take a vacation. In fact, a few weeks ago we went up north for one night and it was a bit hard for me to leave work behind. I don't think of my etsy shop as work. I think of it as fun! Every day I think... what can I make next? What do people need? What do they want? And that's what I try to make. Congrats on two wonderful years. I adore your graphics, love the work you have done for me and am so thankful to know someone so talented. Here's to success and happiness! Yay! Congrats Kelly! What a huge milestone! You sold your first logo in just fifteen minutes after listing it? That’s incredible! It's probably because your designs are beautiful and catchy, that somebody picked it up that quickly. That, or your listing came at the right moment when somebody was looking for a logo for their business. Whichever the reason, your luck was really great that day! All the best!